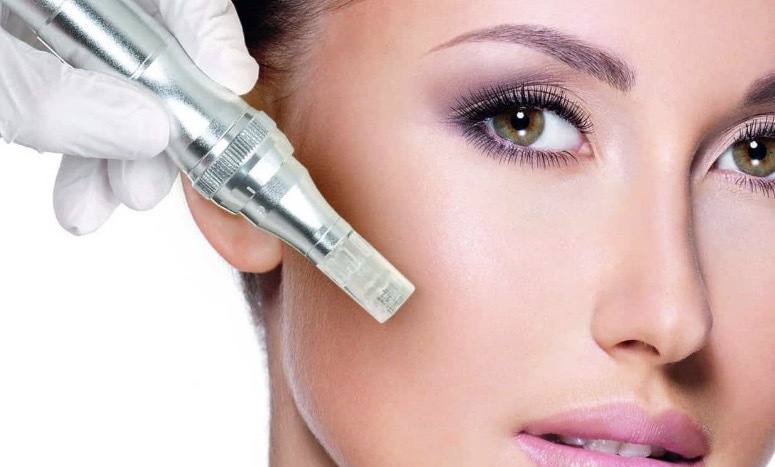 Micro-Needling, is a treatment that we use at Neu Look Med Spa to rejuvenate the skin. The “Vampire Facial” uses the same concept but the difference is that they draw your blood, spin the plasma in a machine and then place it back on to your skin. With Micro-Needling, we use microscopic needles to create mild bleeding during the treatment, then we will massage the blood back to your skin (because your pores are already open from the light abrasions). Micro-Needling is a mildly invasive skin rejuvenation procedure which causes the body to create new collagen and elastin. We glide the pen over the skin with a peptide solution full of nutrients. This will help the skin regain tightness, firmness, reduce scaring, correct large pore size and even stretch marks. Results are typically best seen in a series of treatments; such as 3-6. Many patients who suffer from acne and acne scaring turn to facials to correct the problem. Although we do not offer facials at Neu Look Med Spa, we know they are a wonderfully relaxing and rejuvenating for the face and mind. On a medical level they are usually not strong enough to kill the bacteria that cause acne and boost enough collagen to see any major changes in scaring. We are encouraging our patients to try this more invasive treatment that we know will produce the change we want to see. We at Neu Look do not prefer to perform this service on active breakout that is on a large scale due to the spreading of bacteria but we always prescribe product or a chemical peel (Vitalize or Rejuvinize peels) to prep you for the service. Micro-Needling also helps your skin to absorb product directly into the treated area which will help the overall appearance and health of your skin. Micro-Needling can help to reduce and prevent premature aging. Another lesser known effect of this procedure is it helping with the reduced appearance of stretch marks. It may not completely remove the scar but it can make it shallower and less dark in color. More sessions are usually required but it has been recorded that people have seen good results over time, even with deeper set ones. At Neu Look we have Non-Ablative Fractional (ICON) technology which treats the stretch marks (if less than 6mm in width). Multiple treatments are needed for the best result and they all have minimum downtime. Most hyperpigmentation is caused by over exposure to the sun, damage to the epidermis, inflammation or trauma. Sun damage and age spots are a stubborn issue to correct but studies have proven that Micro-Needling can help to lessen the pigment by generating new, healthy melanin evenly over the skin. This treatment prepares the skin to absorb the right medication for brightening and lightening of the skin. This treatment is even effective on patients who have darker skin tones. Some lasers can cause hyperpigmentation rather than correcting it if used incorrectly (the dark skin needs to be prepared by the lightening agents before laser treatments). In summary the rule of Micro-Needling applies to correcting wrinkles and fine lines, large pores and creates a smoother texture. Call Neu Look Med Spa at (858) 538-5665 to book your free consultation or appointment. If you have any questions feel free to ask one of our treatment educators who would love to help you decide which treatment best suits your desired result.